George Hunt after S. Jones. This tremendously evocative image depicts a coach pulled by four white horses approaching from over the brow of a hill. There are seven passengers on top of the coach sitting alongside the driver with, presumably, more safely ensconced in greater comfort inside. A gentleman with a shotgun stands to the right whilst his gun dogs scamper around the horses. The weather is set fair and an idyllic rolling landscape of fields and hills can be seen in the background. George Hunt was one of the most prolific and successful aquatint engravers working in London during the early to mid-nineteenth century. Along with his brother Charles, he engraved after all the most famous sporting artists of his day and produced some of the most accomplished work of the period. 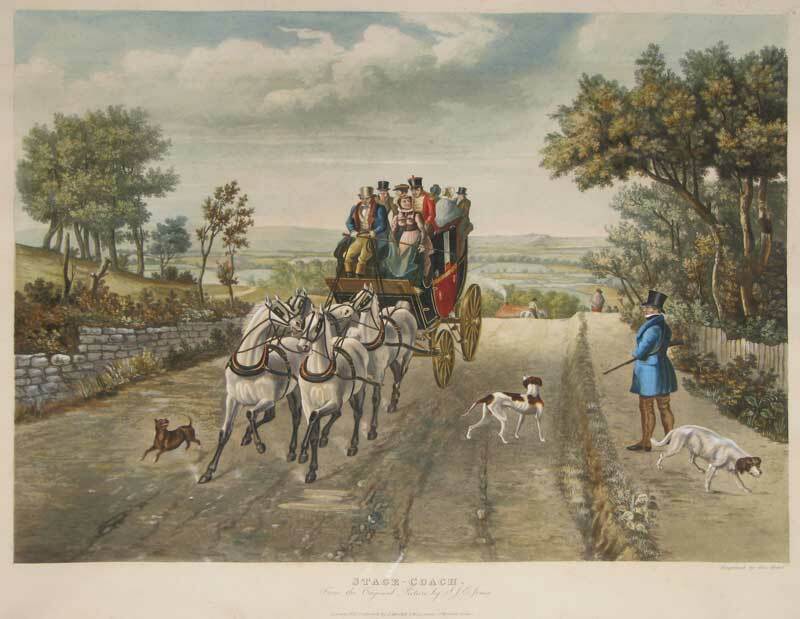 This wonderful coaching scene is typical of their work and shows the heights to which aquatint engraving had reached by the early Victorian period.